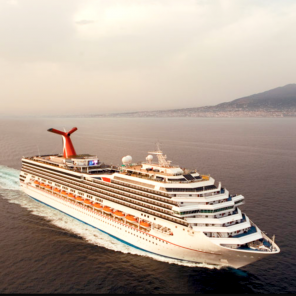 Classical Conversations® annual Capstone Cruise & Graduation is scheduled for April 28-May 3 on board the Carnival Liberty cruise ship, but the deadline for registering for the five-day, four-night cruise is fast approaching. Feb. 15 is the registration deadline for the cruise, so you’ll need to act fast if you want to join in the fun! More than 700 people have registered for the cruise, more than double last year’s, and about 100 Challenge students will participate in the high school graduation, almost three times the number of last year’s graduates. National Memory Master (NMM) and National Number Knockout (N2K) championships will be highlights of the cruise. Sixteen finalists in each competition received all-expenses-paid cruises for themselves and a parent, but at the end of the cruise two students will disembark $10,000 richer. Built in 2005 and completely overhauled in 2011, the 110,000-ton, 952-foot long, Conquest-class Liberty has 13 guest decks and cost half a billion dollars to build. Liberty has accommodations for almost 3,000 guests, served by 1,160 staff and crew. Eating options include Guy’s Burger Joint, inspired by Food Network star Guy Fieri, the Blue Iguana Cantina, the Mongolian Wok, Seafood Shack, and Steakhouse, in addition to the ship’s traditional dining room. There’s plenty to do onboard ship: current and classic movies, live cooking demonstrations by the ship’s chefs, floor shows, the Punchliner Comedy Club, two pools and a giant poolside movie screen, even the giant Twister waterslide. You've played Connect 4 and Yahtzee, but have you ever played giant versions of them onstage in a competition that puts your gaming skills to the test? You'll have your chance when you take part in Hasbro, The Game Show. Team up with your friends and family to win great prizes, all in front of a live audience. For the young and young at heart, Dr. Seuss will be the cruise director. Beginning with the Dr. Seuss character parade, interactive storytime and arts and crafts activities, through the Green Eggs and Ham Breakfast, the world’s greatest children’s storybook author and his unforgettable characters will be front and center. The 2019 Capstone Cruise will depart from Port Canaveral, Florida, at 4 p.m. on Sunday, April 28, returning at 8 a.m. on Thursday, May 2. On Monday while in Nassau, Bahamas, the day will begin early with Graduation in the Venetian Lounge shortly after docking. For the rest of the day, CC cruisers can spend the day on the beach, sightseeing or shopping in Nassau’s famous Straw Market. They will also have opportunities to take great day excursions including history tours, snorkeling, a day at the Atlantis Aquaventure Park, swimming with dolphins or golfing. Tuesday will be spent at Carnival’s own private island—Princess Cay. While 16 Memory Masters will be engaged in a daylong nerve-wracking battle of memory skills, the rest of the cruisers will be basking in the sun on the beautiful, white sands beaches or kicked back in a giant hammock under tall palm trees swaying in the breeze. Lunch is an island barbecue. For those who just can’t lie still, snorkeling and dune buggy tours will be scheduled, along with a coastal cruise of the islands and a glass-bottomed boat excursion over the nearby coral reef. Wednesday will be spent at sea, but the 16 National Number Knockout finalists will hardly notice as they will locked in a titanic battle for numeracy superiority and the N2K championship. The deadline to register for the cruise is Feb. 15. After Feb. 15, cabins may still be available, but the rates will likely go up. For the most current information on the 2019 Capstone Cruise, visit: https://www.classicalconversations.com/capstonecruise. Classical Conversations® is a classical education resource used by homeschoolers in all 50 states and 30 foreign countries. CC now has more than 125,000 students enrolled in its tutoring programs, which are provided by more than 2,500 CC communities. CC provides resources, guidance and a community for a Christian home-school curriculum using classical education in three developmental stages: grammar, dialectic and rhetoric.